The Choir, known as "Festiva" or Guernsey's Festival Chorus and Community choir, celebrated its 30th anniversary in 2015! The Choir is always looking to recruit new members. We would like to see numbers increase by 25% with an all-age 'family feel' grouping, particularly with the aim of adding more under 40s. No experience required; no auditions just a love of singing biblically-based songs, hymns and psalms - all styles of music. Full training and support is given. We meet for rehearsals at Blanchelande College on Monday evenings at 7.30pm. Just contact Roy Sarre, our Musical Director - he's easy-going and friendly! He is inviting all interested voices as potential singers to contact him on tel. no. 01481 263930, e-mail madroy@cwgsy.net or Jose Paine on 01481 721215. Some musical background will help, but no singing experience or auditions are required. All necessary training and support will be provided, including workshops to help bring out the best in you. Just come and rehearse with us at Blanchelande College on Monday evenings at 7.30pm. It is, however, important that you speak to Roy Sarre beforehand rather than just turn up. Try Friendly Festiva for three successive Mondays - and then you can decide whether to join! We welcome all singers but this year seem to be particularly short of sopranos - N.B ability to reach 'top A' is not a pre-requisite! "Men are often written-off as singers at school when they are told that they are spoiling the choir and told to go and play football instead" says Roy Sarre. "But pretty much everyone can sing if given the right encouragement and, who knows, perhaps there are one or two Pavarottis or Domingos walking around Guernsey unaware of the talent they possess." You will all be really welcome. 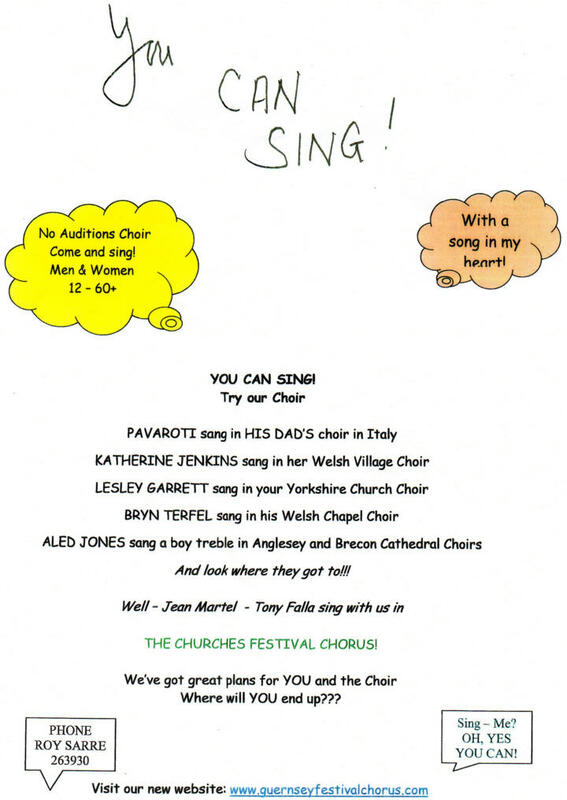 Come along and have a good sing. Complete the online form set out below.